A second release as leader for Law, and his first for Whirlwind Recordings, the guitarist assembles an impressive cast of some of the most exciting on the contemporary UK scene and provides them with a set of original material that must be pretty challenging to play but presented in a way that has engages the listener without losing their attention by bogging things down with technicalities. 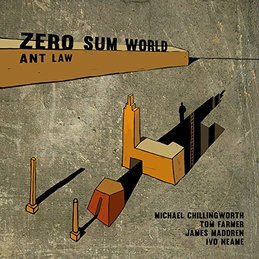 The compositions reveal a depth of meaning with a variety of textures and shifting rhythmical patterns, along with Ant Law’s pioneering use of the ‘Perfect Fourths’ method of tuning for guitarists. With all that is going on in terms of composition and use of alternate tunings it is all too easy to think that what will be on display is a showcase, however nothing could be further from the truth. Much of the material has a rhythmic or melodic hook that is immediately engaging, and ‘Waltz’ positively swings. Chillingworth’s sonorous bass clarinet is deployed effectively on ‘Mishra Jathi’ before giving way to an energetic alto solo from the multi reed man. Fellow saxman, Ivo Neame, this time heard on piano gets a lovely solo on ‘Asymptotes’ accompanied by sensuously melodic lines from guitar. By contrast, ‘Parallel People’ is driven along intently by drummer Maddren for another taut and finely spun alto sax improvisation. Of the leader, Law has a delectable lyrical sensibility both in his playing and writing for the quintet, that blends seamlessly within the context of the material. A long album clocking in at some 70 minutes, Ant succeeds in holding the attention throughout, and perhaps saves the best until last with the penultimate ‘Monument’ with moody bass clarinet and dark forboding lines from guitar and piano that shadow the melodic curve of the piece. The album concludes in a most satisfying manner with ‘Blues’ that features some alternate tuning from Tom Farmer’s double bass giving a new twist to this familiar form. A thoroughly enjoyable set and highly recommended.